ZHUHAI, China, Jan. 28, 2019 /PRNewswire/ -- On the afternoon of January 24, the Zhuhai Design Week Acedemic Committee held its founding conference at Zhuhai International Convention & Exhibition Center. 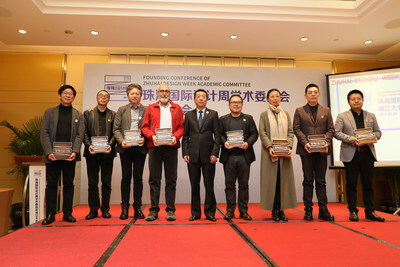 Attendees included Wang Min, deputy director of the academic committee of the China Central Academy of Fine Arts; several academic members, among them Chen Dongliang; executive director of UNESCO ICCSD (The International Center for Creativity and Sustainable Development); representatives from Zhuhai Huafa Group, the organizer of Zhuhai Design Week; and members of the secretariat of the academic committee. At the meeting, academic convener Wang Min gave an introduction on the committee's background, members and the academic orientation of Zhuhai Design Week. Xi Xiaole, representative of Huafa Group which was the event organizer, issued letters of appointment to members, while Ma Chenfeng, secretary general of the committee, gave a speech during which he reviewed the 2018 event and spoke of his expectations for the 2019 Zhuhai Design Week. Wang gave a detailed presentation on the committee's background and members at the meeting. He said that the committee is being established to serve as a high-end academic exchange platform with the goal of improving and strengthening the organization, enhancing the content and brand positioning of Zhuhai Design Week, in a move to continue maintaining the high-level academic quality of the event, and integrating resources to further the development of the design industry in Zhuhai. The academic committee is comprised of one academic convener and eight academic members, who are outstanding practitioners within a design or design-related industry, including the above-mentioned Wang Min and Chen Dongliang, David Grossman, chairman of the International Council of Design; Liu Xiaokang, secretary general of the Hong Kong Federation of Design Associations; Liu Xiaodu, founder of URBANUS; Ma Ke, founder of Wu Yong; Ma Quan, vice dean of the Faculty of Humanities and Arts at Macau University of Science and Technology; Tong Huiming, vice director of the Subcommittee on the Teaching of Industrial Design at the Ministry of Education; and Wang Yudong, vice director of the Office of the Organizing Committee of Beijing Design Week. The academic committee of Zhuhai Design Week has distinguished itself through its high level of scholarship, as well as by the wide range of disciplines that are included and the depth of regional coverage. In terms of the academic level, in addition to the convener, Mr. Wang, (former president of the School of Design of China Central Academy of Fine Arts and, currently, deputy director of the academy's academic committee), who was named a Yangtze River Scholar Professor, the committee includes China's top fashion, industrial and architectural designers, some of Asia's most famous graphic designers and artists as well as leaders from the world's largest organizations of designers. In terms of areas specialization, the academic members come from several different disciplines, including industrial, architectural, fashion and art design, as well as design education research and production management. In terms of regional coverage, they are from some of the world's leading design centers, including New York, Beijing, Guangzhou, Shenzhen, Hong Kong and Macau. As a result of their efforts, the design industry has established a collaboration and exchange mechanism where high-quality dialogues as well as cooperation between key international and domestic regions takes place, driving the global convergence of the design industry. At the meeting, Xi Xiaole, the representative from Huafa Group and the organizer of the event, issued the letters of appointment, which feature the unique logo of Zhuhai Design Week, to the above-mentioned experts. The academic committee of Zhuhai Design Week held three premium seminars from 9 am to 6 pm on January 24: the preparation and establishment seminars as well as the Zhuhai Design Center seminar at which experts and scholars, through the delivery of presentations and the engagement in discussions, made contributions to the development of a grand blueprint for the design sector of the Guangdong-Hong Kong-Macao Greater Bay Area (the "Bay Area"). During the morning, committee members first discussed the status of social and economic development as well as the regional uniqueness of both the Bay Area and Zhuhai. They believed that in addition to being the right place to hold the design week, Zhuhai has also built the world's top social circle for designers through the establishment of the committee. After engaging in discussions on the characteristics, positioning and significance of Zhuhai Design Week, members put forward three proposals: strengthening connections between the design community and a wider range of small and medium-sized firms in order to provide a platform for demonstrating the success of high quality design projects and empowering the transformation of businesses and products; increasing the number of dialogs and quality of communications among designers across the world's design industry hubs and establishing a design industry alliance for the Bay Area as a window to expanding internationally and bringing in resources; accelerating the introduction and commercialization of design and research efforts from university partners. During the afternoon, the committee proposed the idea of building the Zhuhai Design Center platform with the aim of attracting high-end manufacturing and design-related businesses in conjunction with innovative resources from home and abroad through the platform, to drive the transformation of the manufacturing, fashion and tourism sectors in Zhuhai and around the Bay Area. The committee has reached a consensus on how members can complement each other in terms of expertise, resource integration and cooperation: with the holding of Zhuhai Design Week, they will collaborate on bringing in resources from the design sector and exploring how to integrate technology and design through innovative and humanistic thinking. The aim is to drive the deep integration of high-end manufacturing and modern services on the basis of real economy-led industry innovation, make contributions to industrial agglomeration and development of a second generation of entrepreneurship in Zhuhai, further the prosperity of the area's design-related sector, and better meet growing expectations of the local population for a better life. During the seminars, secretary general of the committee Ma Chenfeng reviewed 2018 Zhuhai Design Week. The first edition of the event consisted of 10 sessions, including a design expo, a keynote dialogue and a parallel forum in addition to 22 interactive events, attracting over 1,000 senior designers from more than 10 countries and regions worldwide. Notably, the design expo exceeded the organizers' expectations as it not only attracted over 250,000 onsite visitors and 200,000 online visitors but also received high acclaim from local visitors. 2019 Zhuhai Design Week will be hosted once again by Huafa Group and is highly anticipated by the industry as the organizer plans to add several new topics into the event, including the 70th anniversary of the establishment of New China and the 20th anniversary of Macao's return to China while maintaining sessions that were popular among visitors last year. The committee plans to bring together leading professional think tanks, provide access to top-level design resources and identify some of the area's superior design outcomes in a move to promote the development of the Bay Area's design sector. In addition, the establishment of the committee is expected to lay a sound foundation for the holding of 2019 Zhuhai Design Week, an annual design event that will help Zhuhai become one of the most important design hubs in the Bay Area.